Minamata disease (Japanese: 水俣病, Hepburn: Minamata-byō), sometimes referred to as Chisso-Minamata disease (チッソ水俣病, Chisso-Minamata-byō), is a neurological syndrome caused by severe mercury poisoning. Signs and symptoms include ataxia, numbness in the hands and feet, general muscle weakness, loss of peripheral vision, and damage to hearing and speech. In extreme cases, insanity, paralysis, coma, and death follow within weeks of the onset of symptoms. A congenital form of the disease can also affect fetuses in the womb. Minamata disease was first discovered in Minamata city in Kumamoto prefecture, Japan, in 1956. It was caused by the release of methylmercury in the industrial wastewater from the Chisso Corporation's chemical factory, which continued from 1932 to 1968. This highly toxic chemical bioaccumulated in shellfish and fish in Minamata Bay and the Shiranui Sea, which, when eaten by the local population, resulted in mercury poisoning. While cat, dog, pig, and human deaths continued for 36 years, the government and company did little to prevent the pollution. The animal effects were severe enough in cats that they came to be named as having "dancing cat fever". As of March 2001, 2,265 victims had been officially recognised as having Minamata disease (1,784 of whom had died) and over 10,000 had received financial compensation from Chisso. By 2004, Chisso Corporation had paid $86 million in compensation, and in the same year was ordered to clean up its contamination. On March 29, 2010, a settlement was reached to compensate as-yet uncertified victims. A second outbreak of Minamata disease occurred in Niigata Prefecture in 1965. The original Minamata disease and Niigata Minamata disease are considered two of the four big pollution diseases of Japan. The Chisso Corporation first opened a chemical factory in Minamata in 1908. Initially producing fertilisers, the factory followed the nationwide expansion of Japan's chemical industry, branching out into production of acetylene, acetaldehyde, acetic acid, vinyl chloride, and octanol, among others. The Minamata factory became the most advanced in all of Japan, both before and after World War II. The waste products resulting from the manufacture of these chemicals were released into Minamata Bay through the factory wastewater. These pollutants had an environmental impact. Fisheries were damaged in terms of reduced catches, and in response, Chisso reached two separate compensation agreements with the fishery cooperative in 1926 and 1943. The rapid expansion of the Minamata factory spurred on the local economy and as Chisso prospered, so did Minamata. This fact, combined with the lack of other industry, meant that Chisso had great influence in Minamata. At one point, over half of the tax revenue of Minamata City authority came from Chisso and its employees, and the company and its subsidiaries were responsible for creating a quarter of all jobs in Minamata. Minamata was even dubbed Chisso's "castle town", in reference to the capital cities of feudal lords who ruled Japan during the Edo period. The Chisso Minamata factory first started acetaldehyde production in 1932, producing 210 tons that year. By 1951, production had jumped to 6,000 tons per year and reached a peak of 45,245 tons in 1960. Throughout, the Chisso factory's output amounted to between a quarter and a third of Japan's total acetaldehyde production. The chemical reaction used to produce the acetaldehyde used mercury sulfate as a catalyst. Starting August 1951, the co-catalyst was changed from manganese dioxide to ferric sulfide. A side reaction of this catalytic cycle led to the production of a small amount of an organic mercury compound, namely methylmercury. This highly toxic compound was released into Minamata Bay from the change of the co-catalyst in 1951 until 1968, when this production method was discontinued. On April 21, 1956, a five-year-old girl was examined at the Chisso Corporation's factory hospital in Minamata, Kumamoto, a town on the west coast of the southern island of Kyūshū. The physicians were puzzled by her symptoms: difficulty walking, difficulty speaking, and convulsions. Two days later, her younger sister also began to exhibit the same symptoms and she, too, was hospitalised. The girls' mother informed doctors that her neighbour's daughter was also experiencing similar problems. After a house-to-house investigation, eight further patients were discovered and hospitalised. On May 1, the hospital director reported to the local public health office the discovery of an "epidemic of an unknown disease of the central nervous system", marking the official discovery of Minamata disease. To investigate the epidemic, the city government and various medical practitioners formed the Strange Disease Countermeasures Committee (奇病対策委員会, Kibyō Taisaku Iinkai) at the end of May 1956. Owing to the localised nature of the disease, it was suspected to be contagious and as a precaution patients were isolated and their homes disinfected. Although contagion was later disproved, this initial response contributed to the stigmatisation and discrimination experienced by Minamata victims from the local community. During its investigations, the committee uncovered surprising anecdotal evidence of the strange behaviour of cats and other wildlife in the areas surrounding patients' homes. From around 1950 onward, cats had been seen to have convulsions, go mad, and die. Locals called it the "cat dancing disease" (猫踊り病, neko odori byō), owing to their erratic movement. Crows had fallen from the sky, seaweed no longer grew on the sea bed, and fish floated dead on the surface of the sea. As the extent of the outbreak was understood, the committee invited researchers from Kumamoto University to help in the research effort. The Kumamoto University Research Group was formed on August 24, 1956. Researchers from the School of Medicine began visiting Minamata regularly and admitted patients to the university hospital for detailed examinations. A more complete picture of the symptoms exhibited by patients was gradually uncovered. The disease developed without any prior warning, with patients complaining of a loss of sensation and numbness in their hands and feet. They became unable to grasp small objects or fasten buttons. They could not run or walk without stumbling, their voices changed in pitch, and many patients complained of difficulties seeing, hearing, and swallowing. In general, these symptoms deteriorated and were followed by severe convulsions, coma, and eventually death. By October 1956, 40 patients had been discovered, 14 of whom had died, an alarming mortality rate of 35%. Researchers from Kumamoto University also began to focus on the cause of the strange disease. They found that the victims, often members of the same family, were clustered in fishing hamlets along the shore of Minamata Bay. The staple food of victims was invariably fish and shellfish from Minamata Bay. The cats in the local area, which tended to eat scraps from the family table, had died with symptoms similar to those now discovered in humans. This led the researchers to believe that the outbreak was caused by some kind of food poisoning, with contaminated fish and shellfish being the prime suspects. On November 4, the research group announced its initial findings: "Minamata disease is rather considered to be poisoning by a heavy metal, presumably it enters the human body mainly through fish and shellfish." As soon as the investigation identified a heavy metal as the causal substance, the wastewater from the Chisso plant was immediately suspected as the origin. The company's own tests revealed that its wastewater contained many heavy metals in concentrations sufficiently high to bring about serious environmental degradation, including lead, mercury, manganese, arsenic, thallium, and copper, plus the chalcogen selenium. Identifying which particular poison was responsible for the disease proved to be extremely difficult and time-consuming. During 1957 and 1958, many different theories were proposed by different researchers. At first, manganese was thought to be the causal substance due to the high concentrations found in fish and the organs of the deceased. Thallium, selenium, and a multiple contaminant theory were also proposed, but in March 1958, visiting British neurologist Douglas McAlpine suggested that Minamata symptoms resembled those of organic mercury poisoning, so the focus of the investigation centered on mercury. In February 1959, the mercury distribution in Minamata Bay was investigated. The results shocked the researchers involved. Large quantities of mercury were detected in fish, shellfish, and sludge from the bay. The highest concentrations centred around the Chisso factory wastewater canal in Hyakken Harbour and decreased going out to sea, clearly identifying the plant as the source of contamination. Pollution was so heavy at the mouth of the wastewater canal, a figure of 2 kg of mercury per ton of sediment was measured: a level that would be economically viable to mine. Indeed, Chisso did later set up a subsidiary to reclaim and sell the mercury recovered from the sludge. Hair samples were taken from the victims of the disease and also from the Minamata population in general. In patients, the maximum mercury level recorded was 705 parts per million (ppm), indicating very heavy exposure and in nonsymptomatic Minamata residents, the level was 191 ppm. This compared to an average level of 4 ppm for people living outside the Minamata area. Minamata disease is a poisoning disease that affects mainly the central nervous system and is caused by the consumption of large quantities of fish and shellfish living in Minamata Bay and its surroundings, the major causative agent being some sort of organic mercury compound. During the investigation by researchers at Kumamoto University, the causal substance had been identified as a heavy metal and it was widely presumed that the Chisso plant was the source of the contamination. Chisso was coming under closer scrutiny and to deflect criticism, the wastewater output route was changed. Chisso knew of the environmental damage caused by its wastewater and was well aware that it was the prime suspect in the Minamata disease investigation. Despite this, from September 1958, instead of discharging its waste into Hyakken Harbour (the focus of investigation and source of original contamination), it discharged wastewater directly into Minamata River. The immediate effect was the death of fish at the mouth of the river, and from that point on, new Minamata disease victims began to appear in other fishing villages up and down the coast of the Shiranui Sea, as the pollution spread over an even greater area. Chisso failed to co-operate with the investigation team from Kumamoto University. It withheld information on its industrial processes, leaving researchers to speculate what products the factory was producing and by what methods. The Chisso factory's hospital director, Hajime Hosokawa, established a laboratory in the research division of the plant to carry out his own experiments into Minamata disease in July 1959. Food to which factory wastewater had been added was fed to healthy cats. Seventy-eight days into the experiment, cat 400 exhibited symptoms of Minamata disease and pathological examinations confirmed a diagnosis of organic mercury poisoning. The company did not reveal these significant results to the investigators and ordered Hosokawa to stop his research. In an attempt to undermine Kumamoto University researchers' organic mercury theory, Chisso and other parties with a vested interest that the factory remain open (including the Ministry of International Trade and Industry and the Japan Chemical Industry Association) funded research into alternative causes of the disease, other than its own waste. Polluting wastewater had damaged the fisheries around Minamata ever since the opening of the Chisso factory in 1908. The Minamata Fishing Cooperative had managed to win small payments of "sympathy money" (見舞い金, mimaikin) from the company in 1926 and again in 1943, but after the outbreak of Minamata disease, the fishing situation was becoming critical. Fishing catches had declined by 91% between 1953 and 1957. The Kumamoto prefectural government issued a partial ban on the sale of fish caught in the heavily polluted Minamata Bay, but not an all-out ban, which would have legally obliged it to compensate the fishermen. The fishing cooperative protested against Chisso and angrily forced their way into the factory on 6 August and 12 August, demanding compensation. A committee was set up by Minamata Mayor Todomu Nakamura to mediate between the two sides, but this committee was stacked heavily in the company's favour. On 29 August, the fishing cooperative agreed to the mediation committee's proposal, stating: "In order to end the anxiety of the citizens, we swallow our tears and accept". The company paid the cooperative ¥20 million (US$183,477) and set up a ¥15 million ($137,608) fund to promote the recovery of fishing. Since the change of route of wastewater output in 1958, pollution had spread up and down the Shiranui Sea, damaging fisheries there, too. Emboldened by the success of the small Minamata cooperative, the Kumamoto Prefectural Alliance of Fishing Cooperatives also decided to seek compensation from Chisso. On 17 October, 1,500 fishermen from the alliance descended on the factory to demand negotiations. When this produced no results, the alliance members took their campaign to Tokyo, securing an official visit to Minamata by members of the Japanese Diet. During the visit on 2 November, alliance members forced their way into the factory and rioted, causing many injuries and ¥10 million ($100,000) worth of damage. The violence was covered widely in the media, bringing the nation's attention to the Minamata issue for the first time since the outbreak began. Another mediation committee was set up, and an agreement was hammered out and signed on 17 December. Some ¥25 million of "sympathy money" was paid to the alliance and a ¥65 million fishing recovery fund was established. In 1959, the victims of Minamata disease were in a much weaker position than the fishermen. The recently formed Minamata Disease Patients Families Mutual Aid Society was much more divided than the fishing cooperatives. Patients' families were the victim of discrimination and ostracism from the local community. Local people felt that the company (and their city that depended upon it) was facing economic ruin. To some patients, this ostracism by the community represented a greater fear than the disease itself. After beginning a sit-in at the factory gates in November 1959, the patients asked Kumamoto Prefecture Governor Hirosaku Teramoto to include the patients' request for compensation with the mediation that was ongoing with the prefectural fishing alliance. Chisso agreed and after a few weeks' further negotiation, another "sympathy money" agreement was signed. Patients who were certified by a Ministry of Health and Welfare committee would be compensated: adult patients received ¥100,000 ($917) per year; children ¥30,000 ($275) per year, and families of dead patients would receive a one-off ¥320,000 ($2935) payment. On October 21, 1959, Chisso was ordered by the Ministry of International Trade and Industry to switch back its wastewater drainage from the Minamata River to Hyakken Harbour and to speed up the installation of wastewater treatment systems at the factory. Chisso installed a Cyclator purification system on December 19, 1959, and opened it with a special ceremony. 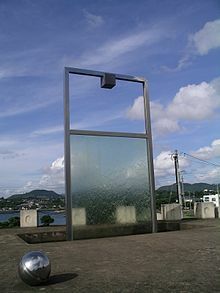 Chisso's president Kiichi Yoshioka drank a glass of water supposedly treated through the Cyclator to demonstrate that it was safe. In fact, the wastewater from the acetaldehyde plant, which the company knew still contained mercury and led to Minamata disease when fed to cats, was not treated through the Cyclator at the time. Testimony at a later Niigata Minamata disease trial proved that Chisso knew the Cyclator to be completely ineffective: "The purification tank was installed as a social solution and did nothing to remove organic mercury." The deception was successful and almost all parties involved in Minamata disease were duped into believing that the factory's wastewater had been made safe from December 1959 onward. This widespread assumption meant that doctors were not expecting new patients to appear, resulting in numerous problems in the years to follow, as the pollution continued. In most people's minds, the issue of Minamata disease had been resolved. The years between the first set of "sympathy money" agreements in 1959 and the start of the first legal action to be taken against Chisso in 1969 are often called the "ten years of silence". In fact, much activity on the part of the patients and fishermen took place during this period, but nothing had a significant impact on the actions of the company or the coverage of Minamata in the national media. Despite the almost universal assumption to the contrary, the wastewater treatment facilities installed in December 1959 had no effect on the level of organic mercury being released into the Shiranui Sea. The pollution and the disease it caused continued to spread. The Kumamoto and Kagoshima prefectural governments conducted a joint survey in late 1960 and early 1961 into the level of mercury in the hair of people living around the Shiranui Sea. The results confirmed that organic mercury had spread all around the inland sea and that people were still being poisoned by contaminated fish. Hundreds of people were discovered to have levels greater than 50 ppm of mercury in their hair, the level at which people are likely to experience nerve damage. The highest result recorded was that of a woman from Goshonoura island who had 920 ppm in her sample. The prefectural governments did not publish the results and did nothing in response to these surveys. The participants who had donated hair samples were not informed of their result, even when they requested it. A follow-up study ten years later discovered that many had died from "unknown causes". Local doctors and medical officials had noticed for a long time an abnormally high frequency of cerebral palsy and other infantile disorders in the Minamata area. In 1961, a number of medical professionals including Masazumi Harada (later to receive an honour from the United Nations for his body of work on Minamata disease) set about re-examining children diagnosed with cerebral palsy. The symptoms of the children closely mirrored those of adult Minamata disease patients, but many of their mothers did not exhibit symptoms. The fact that these children had been born after the initial outbreak and had never been fed contaminated fish also led their mothers to believe they were not victims. At the time the medical establishment believed the placenta would protect the foetus from toxins in the bloodstream, which is indeed the case with most chemicals. What was not known at the time was that exactly the opposite is the case with methylmercury: the placenta removes it from the mother's bloodstream and concentrates the chemical in the foetus. After several years of study and the autopsies of two children, the doctors announced that these children were suffering from an as yet unrecognised congenital form of Minamata disease. The certification committee convened on 29 November 1962 and agreed that the two dead children and the 16 children still alive should be certified as patients, and therefore liable for "sympathy" payments from Chisso, in line with the 1959 agreement. Minamata disease broke out again in 1965, this time along the banks of the Agano River in Niigata Prefecture. The polluting factory (owned by Showa Denko) employed a chemical process using a mercury catalyst very similar to that used by Chisso in Minamata. As in Minamata, from the autumn of 1964 to the spring of 1965, cats living along the banks of the Agano River had been seen to go mad and die. Before long, patients appeared with identical symptoms to patients living on the Shiranui Sea, and the outbreak was made public on 12 June 1965. Researchers from the Kumamoto University Research Group and Hajime Hosokawa (who had retired from Chisso in 1962) used their experience from Minamata and applied it to the Niigata outbreak. In September 1966, a report was issued proving Showa Denko's pollution to be the cause of this second Minamata disease. Unlike the patients in Minamata, the victims of Showa Denko's pollution lived a considerable distance from the factory and had no particular link to the company. As a result, the local community was much more supportive of patients' groups and a lawsuit was filed against the company in March 1968, only three years after discovery. The events in Niigata catalysed a change in response to the original Minamata incident. The scientific research carried out in Niigata forced a re-examination of that done in Minamata and the decision of Niigata patients to sue the polluting company allowed the same response to be considered in Minamata. Masazumi Harada has said that, "It may sound strange, but if this second Minamata disease had not broken out, the medical and social progress achieved by now in Kumamoto... would have been impossible." Around this time, two other pollution-related diseases were also grabbing headlines in Japan. Victims of Yokkaichi asthma and Itai-itai disease were forming citizens' groups and filed lawsuits against the polluting companies in September 1967 and March 1968, respectively. As a group, these diseases came to be known as the four big pollution diseases of Japan. Slowly but surely, the mood in Minamata and Japan as a whole was shifting. Minamata patients found the public gradually becoming more receptive and sympathetic as the decade wore on. This culminated in 1968 with the establishment in Minamata of the Citizens' Council for Minamata Disease Countermeasures, which was to become the chief citizens' support group to the Minamata patients. A founding member of the citizens' council was Michiko Ishimure, a local housewife and poet who later that year published Pure Land, Poisoned Sea: Our Minamata disease (苦海浄土―わが水俣病, Kugai Jōdo: Waga Minamatabyō) a book of poetic essays that received national acclaim. Minamata disease is a disease of the central nervous system, a poisoning caused by long-term consumption, in large amounts, of fish and shellfish from Minamata Bay. The causative agent is methylmercury. Methylmercury produced in the acetaldehyde acetic acid facility of Shin Nihon Chisso's Minamata factory was discharged in factory wastewater... Minamata disease patients last appeared in 1960, and the outbreak has ended. This is presumed to be because consumption of fish and shellfish from Minamata Bay was banned in the fall of 1957, and the fact that the factory had waste-treatment facilities in place from January 1960. The conclusion contained many factual errors: eating fish and shellfish from other areas of the Shiranui Sea, not just Minamata Bay, could cause the disease; eating small amounts, as well as large amounts of contaminated fish over a long time also produced symptoms; the outbreak had not, in fact, ended in 1960 nor had mercury-removing wastewater facilities been installed in January 1960. Nevertheless, the government announcement brought a feeling of relief to a great many victims and their families. Many felt vindicated in their long struggle to force Chisso to accept responsibility for causing the disease and expressed thanks that their plight had been recognised by their social superiors. The struggle now focused on to what extent the victims should be compensated. In light of the government announcement, the patients of the Mutual Aid Society decided to ask for a new compensation agreement with Chisso and submitted the demand on the 6th of October. The company replied that it was unable to judge what would be fair compensation and asked the national government to set up a binding arbitration committee to decide. This proposal split the members of the patients' society, many of whom were extremely wary of entrusting their fate to a third party, as they had done in 1959 with unfortunate results. At a meeting on the 5th of April 1969, the opposing views within the society could not be reconciled and the organisation split into the arbitration group (who were willing to accept binding arbitration) and the litigation group (who decided to sue the company). That summer, Chisso sent gifts to the families who opted for arbitration rather than litigation. An arbitration committee was duly set up by the Ministry of Health and Welfare on 25 April, but it took almost a year to draw up a draft compensation plan. A newspaper leak in March 1970 revealed that the committee would ask Chisso to pay only ¥2 million ($5,600) for dead patients and ¥140,000 to ¥200,000 ($390 to $560) per year to surviving patients. The arbitration group were dismayed by the sums on offer. They petitioned the committee, together with patients and supporters of the litigation group, for a fairer deal. The arbitration committee announced their compensation plan on 25 May in a disorderly session at the Ministry of Health and Welfare in Tokyo. Thirteen protesters were arrested. Instead of accepting the agreement as they had promised, the arbitration group asked for increases. The committee was forced to revise its plan and the patients waited inside the ministry building for two days while they did so. The final agreement was signed on 27 May. Payments for deaths ranged from ¥1.7 million to ¥4 million ($4,700 to $11,100), one-time payments from ¥1 million to ¥4.2 million ($2,760 to $11,660) and annual payments between ¥170,000 and ¥380,000 ($470 to $1,100) for surviving patients. 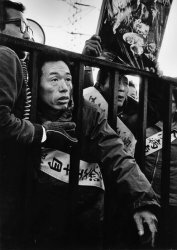 On the day of the signing, the Minamata Citizens' Council held a protest outside the Minamata factory gates. One of the Chisso trade unions held an eight-hour strike in protest at the poor treatment of the arbitration group by their own company. The litigation group, representing 41 certified patients (17 already deceased) in 28 families, submitted their suit against Chisso in the Kumamoto District Court on 14 June 1969. The leader of the group, Eizō Watanabe (a former leader of the Mutual Aid Society), declared, "Today, and from this day forth, we are fighting against the power of the state." Those who decided to sue the company came under fierce pressure to drop their lawsuits. One woman was visited personally by a Chisso executive and harassed by her neighbours. She was ignored, her family's fishing boat used without permission, their fishing nets were cut, and human faeces were thrown at her in the street. The litigation group and their lawyers were helped substantially by an informal national network of citizens' groups that had sprung up around the country in 1969. The Associations to Indict [Those Responsible for] Minamata Disease (水俣病を告発する会, Minamata-byō o Kokuhatsu Suru Kai) were instrumental in raising awareness and funds for the lawsuit. The Kumamoto branch, in particular, was especially helpful to the case. In September 1969, they set up a Trial Research Group, which included law professors, medical researchers (including Masazumi Harada), sociologists and even the housewife and poet Michiko Ishimure to provide useful material to the lawyers to improve their legal arguments. In fact, their report, Corporate Responsibility for Minamata Disease: Chisso's Illegal Acts, published in August 1970, formed the basis of the ultimately successful lawsuit. The trial lasted almost four years. The litigation group lawyers sought to prove Chisso's corporate negligence. Three main legal points had to be overcome to win the case. First, the lawyers had to show that methylmercury caused Minamata disease and that the company's factory was the source of pollution. The extensive research by Kumamoto University and the government conclusion meant that this point was proved quite easily. Second, could and should the company have anticipated the effect of its wastewater and should it have taken steps to prevent the tragedy (i.e., was the company negligent in its duty of care)? Third, was the "sympathy money" agreement of 1959, which forbade the patients from claiming any further compensation, a legally binding contract? The trial heard from patients and their families, but the most important testimony came from Chisso executives and employees. The most dramatic testimony came from Hajime Hosokawa, who spoke on 4 July 1970 from his hospital bed where he was dying of cancer. He explained his experiments with cats, including the infamous "cat 400", which developed Minamata disease after being fed factory wastewater. He also spoke of his opposition to the 1958 change in wastewater output route from Hyakken Harbour to Minamata River. His testimony was backed up by a colleague who also told how company officials had ordered them to halt their cat experiments in the autumn of 1959. Hajime Hosokawa died three months after giving his testimony. Former factory manager Eiichi Nishida admitted that the company put profits ahead of safety, resulting in dangerous working conditions and a lack of care with mercury. Former Chisso President Kiichi Yoshioka admitted that the company promoted a theory of dumped World War II explosives, though it knew it to be unfounded. The defendant's factory was a leading chemical plant with the most advanced technology and ... should have assured the safety of its wastewater. The defendant could have prevented the occurrence of Minamata disease or at least have kept it at a minimum. We cannot find that the defendant took any of the precautionary measures called for in this situation whatsoever. The presumption that the defendant had been negligent from beginning to end in discharging wastewater from its acetaldehyde plant is amply supported. The defendant cannot escape liability for negligence. The "sympathy money" agreement was found to be invalid and Chisso was ordered to make one-time payments of ¥18 million ($66,000) for each deceased patient and from ¥16 million to ¥18 million ($59,000 to $66,000) for each surviving patient. The total compensation of ¥937 million ($3.4 million) was the largest sum ever awarded by a Japanese court. While the struggles of the arbitration and litigation groups against Chisso were continuing, a new group of Minamata disease sufferers emerged. To qualify for compensation under the 1959 agreement, patients had to be officially recognised by various ad hoc certification committees according to their symptoms. However, in an effort to limit the liability and financial burden on the company, these committees were sticking to a rigid interpretation of Minamata disease. They required that patients must exhibit all symptoms of Hunter-Russell syndrome – the standard diagnosis of organic mercury poisoning at the time – which originated from an industrial accident in the United Kingdom in 1940. The committee certified only patients exhibiting explicit symptoms of the British syndrome, rather than basing their diagnosis on the disease in Japan. This resulted in many applicants being rejected by the committee, leaving them confused and frustrated. As of March 2001, 2,265 victims had been officially certified (1,784 of whom have died) and over 10,000 people had received financial compensation from Chisso, although they were not recognised as official victims. The issue of quantifying the impact of Minamata disease is complicated, as a full epidemiological study has never been conducted and patients were recognised only if they voluntarily applied to a certification council to seek financial compensation. Many victims of Minamata disease faced discrimination and ostracism from the local community if they came out into the open about their symptoms. Some people feared the disease to be contagious, and many local people were fiercely loyal to Chisso, depending on the company for their livelihoods. In this atmosphere, sufferers were reluctant to come forward and seek certification. Despite these factors, over 17,000 people have applied to the council for certification. Also, in recognising an applicant as a Minamata disease sufferer, the certification council qualified that patient to receive financial compensation from Chisso. For that reason, the council has always been under immense pressure to reject claimants and minimise the financial burden placed on Chisso. Rather than being a council of medical recognition, the decisions of the council were always affected by the economic and political factors surrounding Minamata and the Chisso corporation. Furthermore, compensation of the victims led to continued strife in the community, including unfounded accusations that some of the people who sought compensation did not actually suffer from the disease. More properly, the impact should be called a criminal 'poisoning', not a clinical 'disease'. These forms of obfuscation are commonly experienced by 'environmental victims' in many countries. According to Timothy S. George, the environmental protests that surrounded the disease appeared to aid in the democratization of Japan. When the first cases were reported and subsequently suppressed, the rights of the victims were not recognised, and they were given no compensation. Instead, the afflicted were ostracised from their community due to ignorance about the disease, as people were afraid that it was contagious. The people directly impacted by the pollution of Minamata Bay were not originally allowed to participate in actions that would affect their future. Disease victims, fishing families, and company employees were excluded from the debate. Progress occurred when Minamata victims were finally allowed to come to a meeting to discuss the issue. As a result, postwar Japan took a small step toward democracy. Through the evolution of public sentiments, the victims and environmental protesters were able to acquire standing and proceed more effectively in their cause. The involvement of the press also aided the process of democratization because it caused more people to become aware of the facts of Minamata disease and the pollution that caused it. Although the environmental protests did result in Japan becoming more democratized, it did not completely rid Japan of the system that first suppressed the fishermen and victims of Minamata disease. The song "Kepone Factory" on Dead Kennedys' In God We Trust, Inc. makes reference to the disaster in its chorus. The song "The Disease of the Dancing Cats" by the band Bush on "The Science of Things" album is in reference to the disaster. Photographic documentation of Minamata started in the early 1960s. One photographer who arrived in 1960 was Shisei Kuwabara, straight from university and photo school, who had his photographs published in Weekly Asahi as early as May 1960. The first exhibition of his photographs of Minamata was held in the Fuji Photo Salon in Tokyo in 1962, and the first of his book-length anthologies, Minamata Disease, was published in Japan in 1965. He has returned to Minamata many times since. However, a dramatic photographic essay by W. Eugene Smith brought world attention to Minamata disease. His Japanese wife and he lived in Minamata from 1971 to 1973. The most famous and striking photo of the essay, Tomoko Uemura in Her Bath (1972) shows Ryoko Uemura, holding her severely deformed daughter, Tomoko, in a Japanese bath chamber. Tomoko was poisoned by methylmercury while still in the womb. The photo was very widely published. It was posed by Smith with the co-operation of Ryoko and Tomoko to dramatically illustrate the consequences of the disease. It has subsequently been withdrawn from circulation at the request of Tomoko's family, so does not appear in recent anthologies of Smith's works. Smith and his wife were extremely dedicated to the cause of the victims of Minamata disease, closely documenting their struggle for recognition and right to compensation. Smith was himself attacked and seriously injured by Chisso employees in an incident in Goi, Ichihara city, near Tokyo on January 7, 1972, in an attempt to stop the photographer from further revealing the issue to the world. The 54-year-old Smith survived the attack, but his sight in one eye deteriorated and his health never fully recovered before his death in 1978. Japanese photographer Takeshi Ishikawa, who assisted Smith in Minamata, has since exhibited his own photographs documenting the disease. His photographs cover the years 1971 to the present, with Minamata victims as his subjects. The prominent Japanese documentary filmmaker Noriaki Tsuchimoto made a series of films, starting with Minamata: The Victims and Their World (1971) and including The Shiranui Sea (1975), documenting the incident and siding with the victims in their struggle against Chisso and the government. Minamata disease remains an important issue in contemporary Japanese society. Lawsuits against Chisso and the prefectural and national governments are still continuing and many regard the government responses to date as inadequate. The company's "historical overview" in its current website makes no mention of their role in the mass contamination of Minamata and the dreadful aftermath. Their 2004 Annual Report however reports an equivalent of about US$50 million (5,820 million yen) in "Minamata Disease Compensation Liabilities". From 2000 to 2003, the company also reported total compensation liabilities of over US$170 million. Their 2000 accounts also show that the Japanese and Kumamoto prefectural governments waived an enormous US$560 million in related liabilities. Their FY2004 and FY2005 reports refer to Minamata disease as "mad hatter's disease", a term coined from the mercury poisoning experienced by hat-makers of the last few centuries (cf. Erethism). A memorial service was held at the Minamata Disease Municipal Museum on 1 May 2006 to mark 50 years since the official discovery of the disease. Despite bad weather, the service was attended by over 600 people, including Chisso chairman Shunkichi Goto and Environment Minister Yuriko Koike. On Monday, March 29, 2010, a group of 2,123 uncertified victims reached a settlement with the government of Japan, the Kumamoto Prefectural government, and Chisso Corporation to receive individual lump-sum payments of 2.1 million yen and monthly medical allowances. Most congenital patients are now in their forties and fifties and their health is deteriorating. Their parents, who are often their only source of care, are into their seventies or eighties or already deceased. Often these patients find themselves tied to their own homes and the care of their family, effectively isolated from the local community. Some welfare facilities for patients do exist. One notable example is Hot House (ほっとはうす, Hotto Hausu), a vocational training centre for congenital patients as well as other disabled people in the Minamata area. Hot House members are also involved in raising awareness of Minamata disease, often attending conferences and seminars as well as making regular visits to elementary schools throughout Kumamoto Prefecture. Currently, several research groups are working on methylmercury toxicity. Scientific community trying to decipher the in-depth molecular mechanism of the disease caused due to methylmercury. The critical target of this compound is central nervous system. Various labs across the world are looking for the cure also. Scientists are testing natural products against methylmercury induced toxicity. Recently, Kalaivani et al., found an essential oil extracted from selinum vaginatum exerts neuroprotection against CH3Hg. ^ a b Stephen J. Withrow, David M. Vail, Withrow and MacEwen's Small Animal Clinical Oncology, Elsevier: 2007, ISBN 0721605583, p. 73-4. ^ a b Official government figure as of March 2001. See "Minamata Disease: The History and Measures, ch2"
^ Jane Hightower (2008). Diagnosis Mercury: Money, Politics and Poison, Island Press, p. 77. ^ Nabi, Shabnum (2014). "Methylmercury and Minamata Disease". Toxic Effects of Mercury. Springer, New Delhi. pp. 187–199. doi:10.1007/978-81-322-1922-4_25. ISBN 9788132219217. ^ Report of the Social Scientific Study Group on Minamata Disease, In the Hope of Avoiding Repetition of a Tragedy of Minamata Disease, National Institute for Minamata Disease, p. 13. ^ See "Mercury poisoning of thousands confirmed" by Jonathan Watts, The Guardian, 16 October 2001, retrieved 24 October 2006. ^ Kawamura, Hiroki (2017). "The relation between law and technology in Japan: liability for technology-related mass damage in the cases of Minamata disease, asbestos, and the Fukushima Daiichi nuclear disaster". Contemporary Japan. 30 (1): 3–27. doi:10.1080/18692729.2018.1423459. ^ Williams, C. (1998) Environmental Victims: New Risks new Injustice. London Earthscan. ^ George, Timothy S. (2001). Minamata: Pollution and the Struggle for Democracy in Postwar Japan. Harvard University Asia Center. ISBN 0-674-00785-9. ^ "Shisei Kuwabara – 'Minamata': The Starting point of the work of the photojournalist, Shisei Kuwabara", KMoPA. (In Japanese, despite the English title.) Accessed 4 January 2012. ^ Read the thoughts of a photography magazine editor surrounding the controversy of the photograph's withdrawal: "Tomoko Uemura, R.I.P." by Jim Hughes, The Digital Journalist, retrieved 24 October 2006. ^ Chisso Corporation. "Historical Overview". Chisso Corporation official site. Chisso. Retrieved 8 May 2013. ^ FY2004 and FY2005 financial results. URL retrieved 2008-03-07. ^ Hirano, Keiji, Kyodo News, "Mercury pact falls short on Minamata", Japan Times, 1 March 2012, p. 3. Wikimedia Commons has media related to Minamata disease. Amelioration of methylmercury induced neural damage by essential oil of Selinum vaginatum (Edgew) C. B. Clarke . This page was last edited on 10 April 2019, at 04:37 (UTC).